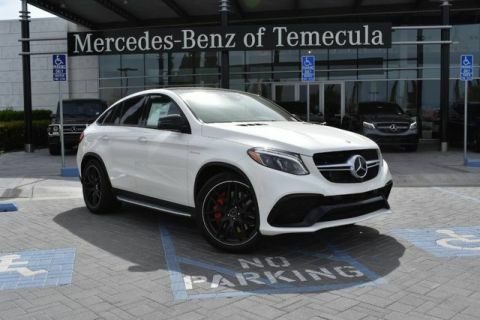 This 2019 Mercedes-Benz GLE AMG® GLE 43 is offered to you for sale by Mercedes-Benz of Temecula. This Mercedes-Benz includes: ANTHRACITE POPLAR WOOD TRIM Woodgrain Interior Trim TRAILER HITCH Tow Hitch PREMIUM 3 PACKAGE Lane Departure Warning Automatic Parking Lane Keeping Assist Back-Up Camera Brake Assist Adaptive Cruise Control Blind Spot Monitor Pass-Through Rear Seat WHEEL LOCKS (PIO) *PRICE TO FOLLOW* Wheel Locks 3-ZONE CLIMATE CONTROL Multi-Zone A/C A/C Climate Control Rear A/C NIGHT PACKAGE AIR IONIZATION W/AIR FILTER AMG® LINE INTERIOR LOCKABLE REAR COMPARTMENT BLACK HEADLINER HIGH-PERFORMANCE SUMMER TIRES Tires - Front All-Season Tires - Rear All-Season WHEELS: 22 AMG® TWIN 5-SPOKE W/BLACK ACCENTS Tires - Front All-Season Aluminum Wheels Tires - Rear All-Season SOFT-CLOSE DOORS CARGO MANAGEMENT SYSTEM *Note - For third party subscriptions or services, please contact the dealer for more information. * Want more room? Want more style? This Mercedes-Benz GLE is the vehicle for you. Pull up in the vehicle and the valet will want to parked on the front row. This Mercedes-Benz GLE is the vehicle others dream to own. Don't miss your chance to make it your new ride. When driving an all wheel drive vehicle, such as this Mercedes-Benz GLE AMG® GLE 43, superior acceleration, traction, and control come standard. 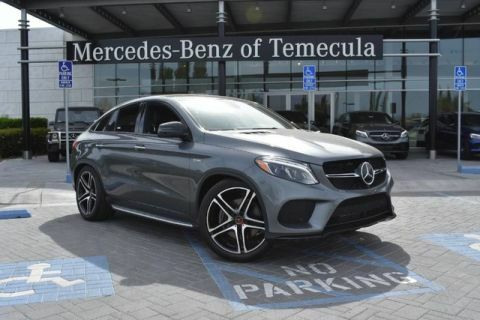 You can find this 2019 Mercedes-Benz GLE AMG® GLE 43 and many others like it at Mercedes-Benz of Temecula. This Mercedes-Benz includes: TRAILER HITCH Tow Hitch PREMIUM 3 PACKAGE Lane Departure Warning Automatic Parking Lane Keeping Assist Back-Up Camera Brake Assist Adaptive Cruise Control Blind Spot Monitor Pass-Through Rear Seat REAR SEAT ENTERTAINMENT PRE-WIRING AMG® CARBON FIBER/BLACK PIANO LACQUER TRIM WHEEL LOCKS (PIO) *PRICE TO FOLLOW* Wheel Locks 3-ZONE CLIMATE CONTROL Multi-Zone A/C A/C Climate Control Rear A/C NIGHT PACKAGE MULTICONTOUR FRONT SEATS W/MASSAGE FEATURE Seat-Massage Power Passenger Seat Power Driver Seat SPORT STEERING WHEEL AIR IONIZATION W/AIR FILTER BLACK HEADLINER HIGH-PERFORMANCE SUMMER TIRES Tires - Front All-Season Tires - Rear All-Season SOFT-CLOSE DOORS BRUSHED ALUMINUM ILLUMINATED RUNNING BOARDS Running Boards/Side Steps HEATED & VENTILATED FRONT SEATS Cooled Front Seat(s) Heated Front Seat(s) *Note - For third party subscriptions or services, please contact the dealer for more information. * This SUV gives you versatility, style and comfort all in one vehicle. There's a level of quality and refinement in this Mercedes-Benz GLE that you won't find in your average vehicle. Once you see this Mercedes-Benz, you'll quickly see that this is the perfect vehicle for the outdoor junky! You'll even feel relaxed knowing that this All-Wheel drive vehicle will get you to where you are going no matter what may come your way. Also, with this Mercedes-Benz GLE's dependable control you'll be able to drive into the sunset without a care in the world! Mercedes-Benz of Temecula is excited to offer this 2019 Mercedes-Benz GLE. This Mercedes-Benz includes: NIGHT PACKAGE PREMIUM 3 PACKAGE Lane Departure Warning Lane Keeping Assist Brake Assist Adaptive Cruise Control Blind Spot Monitor ANTHRACITE POPLAR WOOD TRIM Woodgrain Interior Trim WHEELS: 22 BLACK AMG® CROSS-SPOKE Aluminum Wheels TRAILER HITCH Tow Hitch *Note - For third party subscriptions or services, please contact the dealer for more information. * Want more room? Want more style? This Mercedes-Benz GLE is the vehicle for you. Pull up in the vehicle and the valet will want to parked on the front row. This Mercedes-Benz GLE is the vehicle others dream to own. Don't miss your chance to make it your new ride. No matter the weather conditions or terrain, this Black AWD Mercedes-Benz GLE handles with an elegant confidence. Fine interior appointments complement this vehicle's unprecedented performance. Contact Mercedes-Benz of Temecula today for information on dozens of vehicles like this 2019 Mercedes-Benz GLE AMG® GLE 63 S. This Mercedes-Benz includes: AIR IONIZATION W/AIR FILTER NIGHT PACKAGE SOFT-CLOSE DOORS AMG® PERFORMANCE EXHAUST SYSTEM PREMIUM 3 PACKAGE Lane Departure Warning Lane Keeping Assist Brake Assist Adaptive Cruise Control Blind Spot Monitor BRUSHED ALUMINUM ILLUMINATED RUNNING BOARDS Running Boards/Side Steps 3-ZONE CLIMATE CONTROL Multi-Zone A/C A/C Climate Control Rear A/C REAR SEAT ENTERTAINMENT PRE-WIRING AMG® PERFORMANCE STEERING WHEEL W/DINAMICA INSERTS Leather Steering Wheel WHEELS: 22 BLACK AMG® CROSS-SPOKE Aluminum Wheels AMG® CARBON FIBER/BLACK PIANO LACQUER TRIM HEATED REAR SEATS Heated Rear Seat(s) *Note - For third party subscriptions or services, please contact the dealer for more information. * This SUV gives you versatility, style and comfort all in one vehicle. Pull up in the vehicle and the valet will want to parked on the front row. This Mercedes-Benz GLE is the vehicle others dream to own. Don't miss your chance to make it your new ride. Savor the satisfaction of safety in any condition with this AWD Mercedes-Benz GLE. Superior acceleration, unmatched traction and stability as well as a luxurious interior round out the impressive features of this AWD Mercedes-Benz GLE. 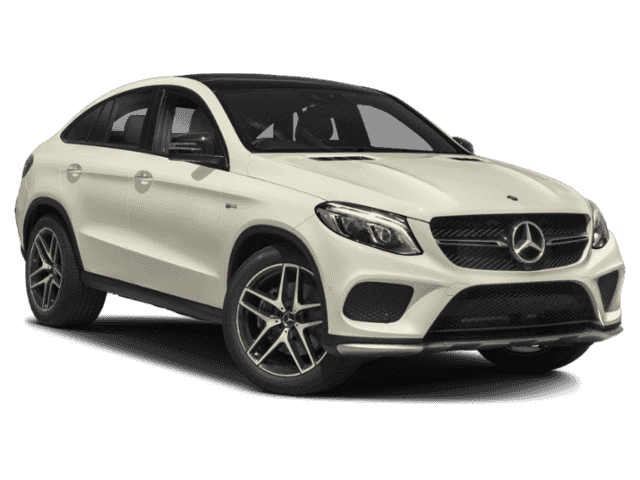 You can find this 2019 Mercedes-Benz GLE AMG® GLE 63 S and many others like it at Mercedes-Benz of Temecula. This Mercedes-Benz includes: AIR IONIZATION W/AIR FILTER NIGHT PACKAGE SOFT-CLOSE DOORS AMG® PERFORMANCE EXHAUST SYSTEM PREMIUM 3 PACKAGE Lane Departure Warning Lane Keeping Assist Brake Assist Adaptive Cruise Control Blind Spot Monitor BRUSHED ALUMINUM ILLUMINATED RUNNING BOARDS Running Boards/Side Steps REAR SEAT ENTERTAINMENT PRE-WIRING AMG® PERFORMANCE STEERING WHEEL W/DINAMICA INSERTS Leather Steering Wheel MULTICONTOUR FRONT SEATS W/MASSAGE FEATURE Seat-Massage Power Passenger Seat Power Driver Seat WHEELS: 22 BLACK AMG® CROSS-SPOKE Aluminum Wheels AMG® CARBON FIBER/BLACK PIANO LACQUER TRIM HEATED REAR SEATS Heated Rear Seat(s) *Note - For third party subscriptions or services, please contact the dealer for more information. * Want more room? Want more style? This Mercedes-Benz GLE is the vehicle for you. There's a level of quality and refinement in this Mercedes-Benz GLE that you won't find in your average vehicle. Comfort. Performance. Safety. Enjoy all three with this well-appointed AWD 2019 Mercedes-Benz.